The PNCWA Student Design Competition is intended to promote “real world” design experience for students interested in pursuing an education and/or career in water/wastewater engineering and sciences. This competition tasks teams of student members within PNCWA to design and present a program meeting the requirements of a problem statement that they have worked on together as a team. This competition is intended for both undergraduate and graduate students, typically completing a capstone project. Examples of Wastewater Design Competition projects include traditional wastewater design projects (e.g. hydraulic capacity design, upgrades to existing systems, biosolids handling, nutrient removal, resource recovery, treatment reorganization, lagoon upgrades, etc.). The Environmental Design Competition includes design projects that address challenges within the water environment at large (e.g. water reclamation and reuse, stormwater management, wetlands, non-centralized treatment in emerging countries, green infrastructure, etc.). The scope and extent of the project should be at the level of a senior or graduate engineering/science student in a design or capstone course. Students are expected to work with little assistance from an advisor and/or professor, and the students are expected to work together as a team to develop their recommended solution. Students may use whatever references or resources they choose, provided they are properly cited. One team from each category will be selected as the winner and sponsored (up to $5,290) to compete in-person at the national WEF Student Design Competition, held in conjunction with the 2019 WEFTEC conference. 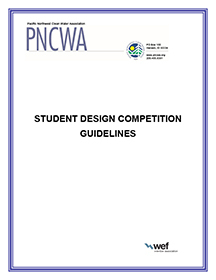 A participation bonus to benefit the teams’ PNCWA Student Chapter will also be offered to teams who fulfill all submittal requirements of this competition, even if they do not advance to the national WEF Student Design Competition. Learn more about the competition guidelines here.